This delicious home made beef stew recipe is courtesy of our contributor Ilona from Ilona’s Passion. 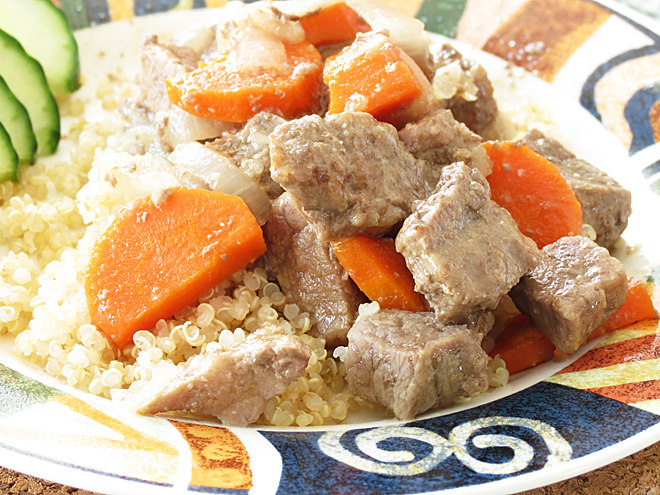 This amazing beef stew recipe with carrots and onions can be easily prepared. Ever since I can remember beef stew was my favourite types of food. When I was a little girl we had nice family gatherings at my grandma’s house. I loved these moments and I will always remember them. My grandma is the best cook ever. She prepares different types of food, and everyday there is something new. When I went to visit her I was always happy when she made her home made beef stew. I admit her beef stew is better than mine. But I always remember how she made it and I’m trying to make it as often as possible at my home. It’s easy but requires a little time. Beef tends to be hard. It requires longer cooking. 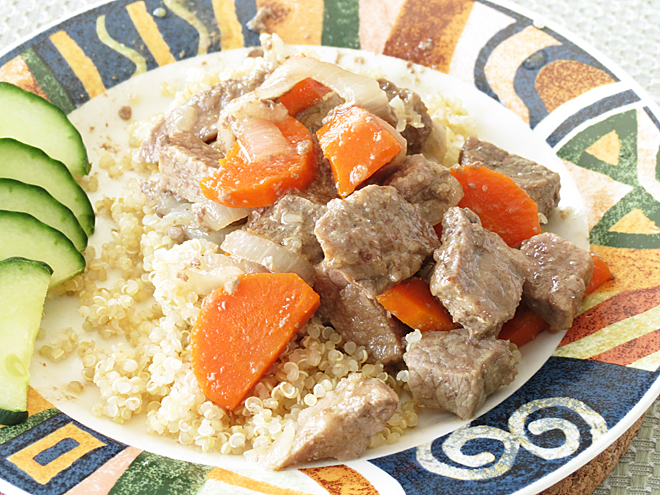 The best part is that beef stew can be served with anything… potatoes, pasta, rice and even quinoa. As you can see I had it with quinoa. My dinner was very good and the whole family loved it. First I cooked my beef on the pan with oil, then I added sliced carrot, sliced onion, some seasoning and everything simmered on low heat for awhile. Also, if you prefer other vegetables you can easily add it as well. However you prefer. The beef stew has to be good. I like it with onions and I think onions are the must in this recipes. Carrot will add a little additional taste. Are you ready for the amazing recipe? Heat the oil on the frying pan. Add some beef and cook for 15 - 20 minutes. Add sliced onions, cook for 10 minutes. Add sliced carrots and some water. Cook on low heat covered for about one hour until the beef is tender and cooked. If it becomes to dry add some water. Repeat if necessary. Serve with potatoes, rice, pasta or quinoa. Do you like beef stew? How do you prepare your stew? I would love to hear from you. 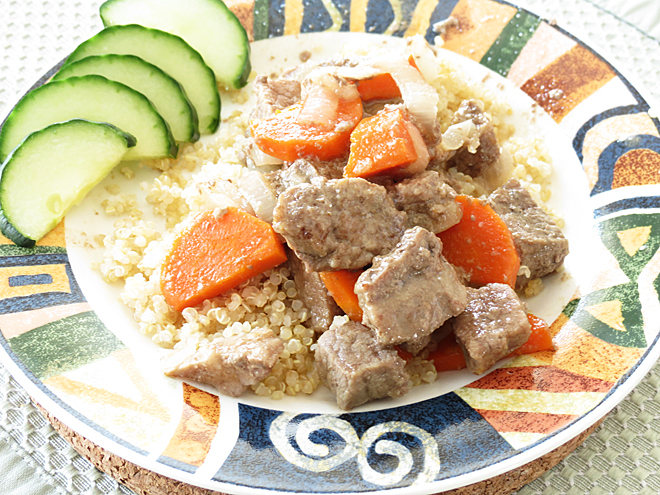 I love an old fashion beef stew the way my Nanny used to make it… but in my slow cooker! Thanks for linking up to Tasty Tuesday last week. I hope you’ll link up again tomorrow! I’ve pinned your great recipe to the Creative K Pinterest board.